Has it really been six months that I’ve been a full-time Chromebook(s goog) user? Indeed it has, based on Amazon(s amzn), which says I ordered the laptop on June 8. So why has my MacBook Air(s aapl) been collecting dust (GASP!) for half of 2012? Mainly because the Chrome OS is precisely no more and no less than what I need for all of my computing needs, save two. When I record videos or podcasts for work, I turn to a desktop computing platform and fire up the Mac. Clearly by Evernote (install). I’ve long used Evernote’s cloud service to store ideas, images and general information. It’s no surprise to me that the company recently picked up $85 million in funding for enterprise workers to do the same. 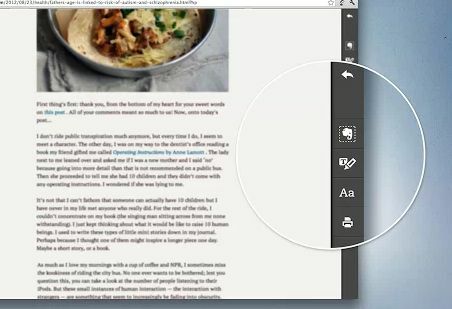 With the Clearly extension, it’s easy to clip items from the web and have them available on every other device I own. But that’s not what I use it for. Instead, with one button tap, the web extension clears all the clutter from any web page and presents it in an easy-to-read format, much like the Reader function does in Apple’s Safari browser. Evernote Premium subscribers can even use Clearly to read web content aloud in one of 21 languages. Pocket (install). This web-clipping service certainly overlaps with Evernote, but I simply like the presentation of web pages better, especially on my mobile devices. The former Read It Later service became Pocket and with its cross-platform support, I generally use it on my Chromebook to send pages to the cloud for later reading on my iPad mini or Galaxy Note 2 smartphone. It’s simple to use too: Just tap the extension button when viewing any web page and you’re done. Once the page is sent to your Pocket account, you can add tags for aiding in content organization. Save to Google Drive (install). This one is relatively new, having just been added by Google recently. But boy is it useful for a Chromebook user; especially someone who recently joined the Chromebook team and got 100 GB of Google Drive storage included with their laptop purchase. This extension that adds a button to save web page links, documents and even media files appears in a right-click context menu, making it easy to save local storage space on your Chromebook. Any.DO (install). 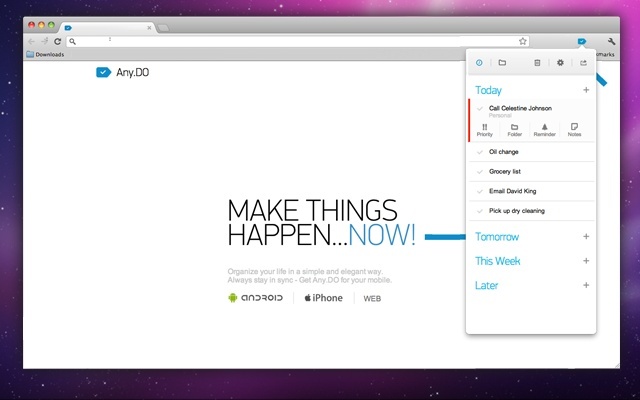 I previously reviewed the Any.DO task management app and since it’s effective and works on all of my devices, I still use it. The Any.DO web extension brings my tasks to the Chromebook, allowing me to see what I need to be working on next. The extension syncs tasks and reminders to my other devices so I don’t have to manage tasks differently depending on what phone or tablet I happen to be using when away from the Chromebook. Send using Gmail (install). Google has its own official extension that I was using to send links over email, but I replaced it with this instead for one simple reason: I wanted to save space on the Chromebook. Instead of having yet another web extension button, this handy bit of code adds an option to “Email this page address” without a button. To access it, just use a two-finger tap on your Chromebook trackpad when viewing a web page and you’ll see the option in a pop-up menu. Choose it, add your recipients and hit send. Note that this extension places occasional ads on your web pages, but you can disable them in the settings. Awesome Screenshot: Capture and Annotate (install). The Chrome OS has built-in screen capture and image editing features but I find this extension to better fit my workflow. It also provides more options: You can capture a selected area of the screen, for example. And it’s simple to mark up an image or annotate it prior to saving. The only issue I have with this extension is that you manually have to right-click to save your captured image. There is a native option to save an image locally, but it doesn’t seem to work on the Chrome OS. Of course, these extensions help me focus on what I use my Chromebook for: Mostly web browsing and blogging at work. (OK, I admit I have the Facebook(s FB) extension installed too.) But the Chrome extension site likely has something for everyone these days. And although many people consider living in a browser too limiting an environment — for some it surely is — these extensions can help turn Chrome OS into more than just a browser. Got any favorite extensions for Chromebooks or the Chrome browser? Drop them in the comments and I’ll take a look! Excellent! Thanks very much! I’m a new Chromebook user and absolutely loving it…these extensions make me see my old Windows machine even further in the rearview mirror! how long does it take to get a full charge? i only got mine yesterday but still trying to figure out how i can get the full 8 hours? One extension that I have started using more is https://chrome.google.com/webstore/detail/print-or-pdf-with-cleanpr/fklmmmdcofimkjmfjdnobmmgmefbapkf?hl=en-US&utm_source=chrome-ntp-launcher which allows me web clip directly to my gDrive or other cloud service in the format that I want. I am fast becoming a Chromebook fan, the only shortcoming that I cannot overcome is the inability to use Silverlight. This locks the device from many services, LoveFilm and Parliament.uk to name just two. Will this ever be solved? Big problem with the Chromebooks, Google Is spyware. And Microsoft is what? And Apple is what? They all sell info. Hahaha. Awesome screenshot is an excellent app and one that I have personally using to make my images look better and also annotate them if I feel the need to do so. I was using Evernote all of the time on my Chromebook until it consistently messed up formatting. I haven’t picked a different one yet but I’m playing with a few. I find it hard to believe that your motivation for switching to the new “send via gmail” extension was to save perhaps 50kb of space on your Chromebook. Thank you for describing your six favorite extensions for the chrome os. I have owned the new Samsung WiFi Chromebook for less than a month and by trial and error learning what works best for me. One extension that I am using often that was not mentioned is MightyText. I am using it on my Macs as well as the Chromebook. About the only process that I have needed to return to my Mac is to update a new website (www.stancee.com) that was developed in RapidWeaver. If you have an Android phone I’d also add MightyText, which lets you send/receive text messages, place phone calls, and other functions as well, all from the browser. If you’re a Google Voice user, I practically live inside the extension. I love being able to respond to SMS messages from the extension and not always have to reach for my phone. Were you aware: Pocket integrates with Evernote, in the sense that items can be Read Later in Pocket then filed permanently in your Evernote personal knowledge base. In iOS, you set this up using the Share button in Pocket and it will present you with your set of notebooks when called. In Android it works even better with the Evernote app being installed; it knows your Evernote tags. So my reading workflow is: Flipboard/browser -> Pocket -> Evernote. I’m a huge fan on the Chrome OS. I’d really like to retire my CR48 and get one of the newer ones.